Home blogging Blogging Tips Google Adsense How to Get A Google Adsense Account Approved Instantly? How to Get A Google Adsense Account Approved Instantly? A lot of bloggers want to make money online using their blog and the best way possible to do so is to have a Google Adsense account and display ads which will get them paid. Well, it may seem easy to say but getting a Google Adsense account approved may sometimes be a big deal with a lot of bloggers facing their application rejection several times. First of all for you to get your Google Adsense account approved, you must have a blog that is atleast 6 months old so for those newbie bloggers, this may seem like a long wait. Also your blog should have a constant traffic that comes, for your Adsense account to be considered. However, lets forget these rules exist as there are ways you can get your Google Adsense account approved as quicker as possible and sometimes even instantly. So as a blogger, I would like to share a blogging secret which I discovered and used to get my Google Adsense account approved and I am sure this secret way of getting your Adsense account approved will help a lot of other bloggers as well. 1. First Sign up for a content writing website where you can connect Google Adsense. I personally used Triond, which you need to to join first in order to start with this process of getting your Adsense approved quickly. CLICK HERE to join. 2. After signing up for Triond, you quickly fill up your details for your profile and then submit articles to Triond. In order for you to apply for Google Adsense, you need to have atleast 5 article posts on Triond. Getting an article published in Triond is very easy and you can basically write anything, even if it is few lines poem so just write something as a post and submit it to Triond. 3. After you've written a minimum of 5 posts at Triond, you can go ahead with the application for Google Adsense. Writing these 5 posts won't take much time as you can just write anything, even if it is a lame joke and publish it. 4. After a minimum of 5 posts are displaying on your profile, go to your earnings tab and click on the option to connect to your Adsense account. 5. Then you're redirected to a page, where you can choose an existing Adsense account or apply for a new Google Adsense account. 6. Choose for the option to apply for a new Google Adsense account and then you'll see the application form for Adsense. 7. The form should be filled basically like how you filled before but the change this time is, in the blog url option, instead of typing the URL for your blog, type the url of your Triond profile. 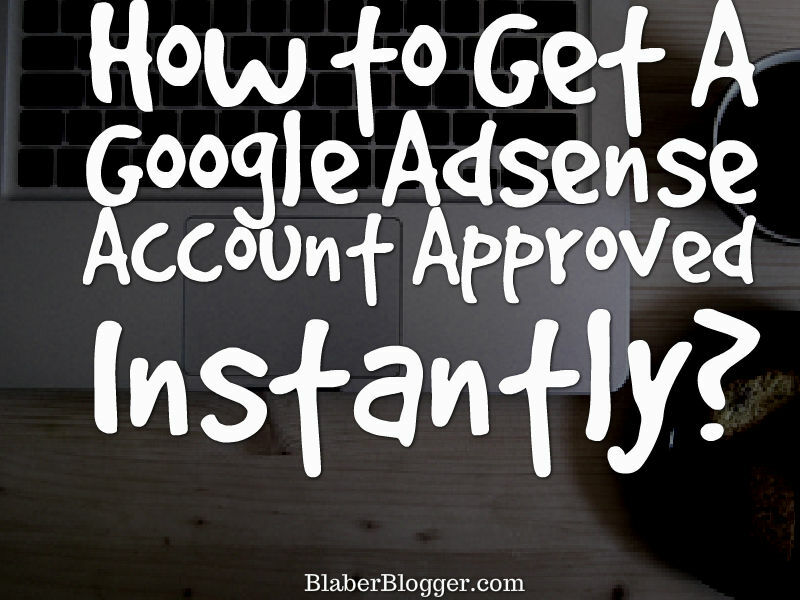 This is the main secret to getting your Adsense account approved instantly. Make sure you type the url of your Triond profile else this won't work. 8. After you fill up all the necessary details and the url to your Triond profile, submit the form for processing. 9. If you've done everything like it is stated, you'll get your Google Adsense approved very quickly, from few days to few hours and sometimes even instantly. So bloggers, try this secret way of getting your Google Adsense account approved instantly and do give me your feedback on the comment section below. You can always continue writing for Triond as well if you want, as this site also pays their writers for the viewers their posts get.